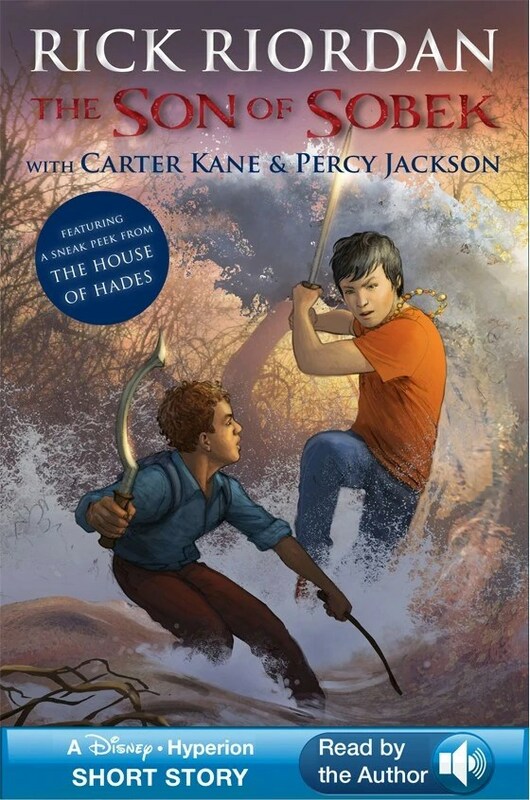 The Son of Sobek is a long needed crossover of Percy Jackson and the Olympians and The Kane Chronicles; written in the point of view of Carter Kane, who unknowingly crosses paths with Percy Jackson. The two boys have to team up to defeat a Pegasai eating crocodile wearing an Egyptian necklace. The whole story could have easily been a few chapters in either of the main characters main books. Humorous and light hearted despite a creature trying to kill the both of them. Riordan opens the door for the two boys’ storylines to merge into (I’m hoping) a crossover trilogy or series of some sort. That would be awesome. My critique and reason for the 3.5 stars can’t be said without spoilers, so here goes it. The all intelligent, ever studious, Carter Kane cannot put two and two together and just assume Percy Jackson is of Greek origin. He went on for half the book talking about how they were so similar, but unfamiliar. They both talk about monsters and gods, but in different ‘dialects’ (Greek terminology vs Egyptian.) But by the end of the story, the two boys decide it is best not to tell each other their origins. I can believe Percy is none the wiser; he needs Annabeth to teach him Greek history. I don’t expect him to know a lick of Egyptian history. But Carter claims he could probably discover what it all means, but he shouldn’t dig. Carter is a book worm, he should be more aware than most high school age students on a little bit of Greek history. I don’t buy into the play dumb card that Riordan used for Carter. This is as bad as Clark Kent taking off his glasses and no one can figure out he is Superman. An Annabeth and Sadie short story just came out. I am anticipating much more from that short story. Annabeth should have no problem figuring out what Carter Kane failed to. 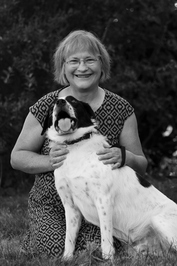 Dianne Astle is one of the newest authors to hit the eBook market. Her new YA fiction, Ben the Dragonborn hit the internet shelves November, 2013. It is the first of many adventures in The Six Worlds Series. 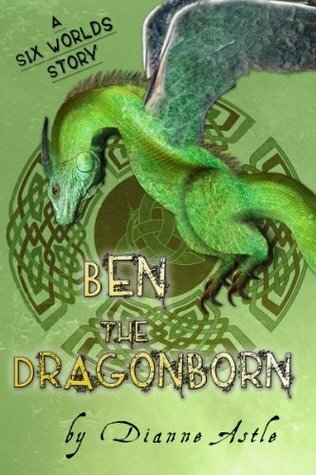 Ben the Dragonborn is an exciting read for adventurous boys and the young at heart. I am certainty looking forward to the next Six Worlds story. Dianne Astle has the first 3 chapters, available for free, on the Ben the Dragonborn website. Head over and jump into the adventure and explore all the extras. I had the pleasure of asking Dianne a few questions about her first book. Check out the interview below and connect with Dianne on twitter to tell her how much you loved the book when you are finished reading! You say you stopped reading fiction for a long time. How long? And how did you start again and create the idea of Ben the Dragonborn? I read very little fiction for over 10 years. Then I came close to crashing and burning during a year when I was home schooling my son as well as working at a challenging job. There was far too much pressure in my life, and it was made worse by rarely taking time to play. In an attempt to maintain sanity I started to read fiction. Sometimes I would read aloud to my son. We went through the entire Narnia and Lord of the Rings series. What books are you reading now, or what type of books do you typically read? My favorite author is Stephen Lawhead. I loved his Endless Knot trilogy. I am also a great fan of Terry Brooks, particularly his Children of Armageddon Series. I liked Narnia, Harry Potter and of course Lord of the Rings. My favorite books are generally fantasy, but I also enjoy mysteries and historical fiction. At the moment I am discovering and reading the Indie authors that I am meeting on line. What is your favorite scene from Ben the Dragonborn? I think my favorite scene comes near the end of the book. It is when Charla the mermaid picks up the Mer king’s crown and hands it to a human. Returning the crown herself would have brought the recognition she longed for. Giving the crown away to humans to return to the Mer king was an act of grace. Are any of your characters similar to you or people you know? I love the characters in Ben the Dragonborn. I enjoy spending time in their company and introducing them to others. I can’t say that any of them are patterned after someone I know. They are likely composites. And I think that a little bit of myself lives in each of the characters. What was your biggest take-away from your first experience writing a novel? To tell you the truth my biggest take-away is amazement that I could write something so fabulous (at least in my biased opinion). I sometimes fear that this is a one-time event and I will never be able to repeat it. Is there anything you wish you did differently in the story or while writing Ben the Dragonborn? I worked really hard to produce a book free of spelling and grammatical errors. When I thought it was perfect and print published the first draft a retired teacher bought it. She gave it back to me with corrections. I was mortified, but also very grateful that she had the courage to draw the mistakes to my attention. So I now know beyond a shadow of a doubt that any future books need to have an editor. I feel strongly that anything we publish needs to be the best it can be. We should not expect people to celebrate books that are full of spelling mistakes and grammatical problems. What was the first character or scene that came into form when writing Ben the Dragonborn? I had the basic idea of six worlds bound together by portals under the care of a Guardian with watchers on each world. The first character to come into being was Ben and his ability to transform into a dragon. Do you have a process or routine when writing or generating ideas? I don’t think anyone would ever hire me to teach a course on how to write a novel. I did not start with a plan laid out from beginning to end. I often found myself going back to add scenes. I added the episode in the library after the rough draft was complete. At one point Ben was in the clutches of a person eating plant. The plant episode did not make the final draft. I was afraid the book was getting too episodic. I wanted to give character development more attention. Are you currently working on a sequel to Ben the Dragonborn? Or working on a new idea? I started writing a sequel. Once I get Ben the Dragonborn well and truly launched I will return to it. In the sequel Ben goes to his mother’s home world to learn how to safely transform into a dragon. Ben must go to his grandfather who will not be happy to learn that he has a half-breed grandson. Do you have plan for more in the Six Worlds Series? I do plan to keep writing and have every intention of writing more Six Worlds books. I think there may be some stories featuring other students from Fairhaven. Perhaps Ben and Denzel will go off world together. There also could be stories of the Chosen who come from other world to Earth. The possibilities are endless. Thank you again to Dianne for taking the time to share with us! Everyone comeback for more reviews and interviews with Dianne Astle, and other new authors. Talk to me on Facebook! Enter your email address to follow Zero2Fiction and receive new reviews by email. The Dragon boy is back! Zero2Fiction · YA Fiction Reviews, Interviews, and more!